1.to destroy or expend by use; use up. 2.to eat or drink up; devour. 3.to destroy, as by decomposition or burning: Fire consumed the forest. 4.to spend (money, time, etc.) wastefully. 5.to absorb; engross: consumed with curiosity. 6.to undergo destruction; waste away. 7.to use or use up consumer goods. This is definition well worth comtemplating in our days of consumer 'affluence', ending though they are. The article below examines the modern day urge to 'consume' and from whence it came. What does it really mean to be a 'consumer' today? 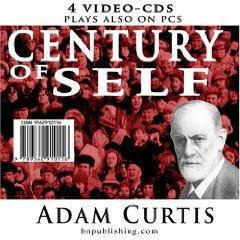 Another excellent history of consumerism, and how we came to measure ourselves by it can be found in the BBC documentary Century of the Self. "We are governed, our minds are molded, our tastes formed, our ideas suggested, largely by men we have never heard of." 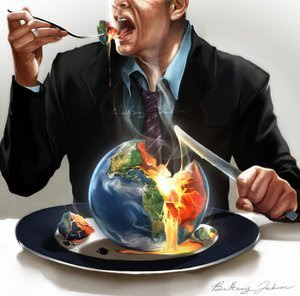 - Edward Bernays To many in both politics and business, the triumph of the self is the ultimate expression of democracy, where power has finally moved to the people. Certainly the people may feel they are in charge, but are they really? The Century of the Self tells the untold and sometimes controversial story of the growth of the mass-consumer society in Britain and the United States. How was the all-consuming self created, by whom, and in whose interests? To hear a free audio recording of E.F. Schumacher's lecture on the solution, click here. Consumption was promoted through advertising as a “democracy of goods” and used to pacify political unrest among workers. With the help of marketers and advertisers exploiting the idea of consumer goods as status symbols, workers were manipulated into being avaricious consumers who could be trusted “to spend more rather than work less.” But if we admired wisdom above wealth, and compassion and cooperation above competition, we could undermine the motivation to consume. Consumerism also played a major role in legitimising a social system which rewards businessmen and top corporate executives with incomes many times those of ordinary workers. The consumer society gives ordinary workers some access to the good life. Surrounded by the bounty of their work — the television set, stereo, car, computer, white goods — they are less likely to question conditions of their work, the way it dominates their life, and the lack of power they have as workers. Advertisers constantly tell them these are the fruits of success, that this is what life is all about. To question a system that delivers such plenty would seem perverse. The growth in production in the late nineteenth and early twentieth centuries required growing markets. This meant expanding the consuming class beyond the middle and upper classes to include the working classes. Production between 1860 and 1920 increased by 12 to 14 times in the US while the population only increased three times.3 Supply outstripped demand and problems of scarcity were replaced by problems of how to create more demand. In this context it was important leisure was not an alternative to work and an opportunity to reflect on life but rather a time for consumption. In this way the forty-hour week, rather than threatening economic growth would foster it. Leisure goods such as radios, phonographs, movies, clothes, books and recreational facilities all benefited from increased leisure time.20 At the same time leisure had to be subordinate to work and importantly, a reason to work. Juliet Schor noted in her book, The Overworked American that by 1991 productivity in the US had increased steadily from the 1940s: “we could now produce our 1948 standard of living (measured in terms of marketed goods and services) in less than half the time it took in that year. We could actually have chosen the four-hour day, or a working year of six months….” Instead, workers work more hours now than in 1948 and consume more than twice as much. 28 It was the “social decision to direct industrial innovation toward producing unlimited quantities of goods rather than leisure” that created the foundation for our modern consumer culture, “a culture of work and spend.” The movement for more free time for workers and leisure time free of market forces, was defeated by the middle of the 20th century when mass consumer culture took off. 29 The consumer culture, rather than eroding the work ethic, tied people even more closely to working long hours in order to earn the money for their consumer desires. Such advertising was so successful people began diverting funds from other purchases into the purchase of a car to enhance their status, and by the end of the 1950s Americans “were spending more of their total income on the family chariot than they were in financing their homestead, which housed the family and its car or cars.”47 Not to be outdone home builders and sellers ensured the home became a status symbol that rivalled the motor car. Chinoy observed consumption provided automobile workers in the 1950s with a way of rationalising their failure to advance in their work: “Advancement has come to mean the progressive accumulation of things as well as the increasing capacity to consume… If one manages to buy a new car, if each year sees a major addition to the household-a washing machine, a refrigerator, a new living-room suite, now probably a television set-then one is also getting ahead.”48 Rather than question the American Dream, workers would either blame themselves for their failure to live up to it, or find other ways to interpret it. The desire to consume is often portrayed as a natural human characteristic that cannot be changed. However it is clear populations have been manipulated into being avaricious consumers. What people really want, more than the multitude of goods on offer, is status. History has shown the determinants of status can change. If we want to live in an ecologically sustainable society, then we need to award status to those who are happy with a basic level of comfort rather than those who accumulate possessions. If, as a community, we admired wisdom above wealth and compassion and cooperation above competition, we would be well on the way to undermining the motivation to consume. This article was first adapted for publication in Pacific Ecologist from chapter 12 of the book Selling the Work Ethic: From Puritan Pulpit to Corporate PR, by Sharon Beder, Publisher Scribe, Melbourne 2000. Professor Sharon Beder is head of the Science, Technology and Society Programme at the University of Wollongong, NSW, Australia. She writes a regular column for Engineers Australia and has written several books including Power Play Toxic Fish and Sewer Surfing; The Nature of Sustainable Development. Professor Beder was awarded the 2001 World Technology Award in Ethics. Roland Marchand, Advertising the American Dream: Making way for modernity, 1920-1940 (Berkeley: University of California Press, 1985), p, 158. Stuart Ewen, Captains of Consciousness: Advertising and the Social Roots of the Consumer Culture( New York: McGraw-Hill, 1976), pp. 70, 108. David J. Cherrington, The Work Ethic: Working Values and Values that Work (New York: AMACON, 1980), p. 37. Gary Cross, Time and Money (London: Routledge, 1993), p. 38; Rodney Clapp, ‘Why the Devil Takes Visa’, Christianity Today, Vol. 40, No. 11 (1996). Cross, note 7, pp. 7-8, 28. Ibid., pp. 7,9,39; Benjamin Kline Hunnicutt, Work Without End: Abandoning Shorter Hours for the Right to Work (Philadelphia: Temple University Press, 1988), pp. 42, 67. Paul Bernstein, American Work Values: Their Origin and Development (Albany, NY: State University of New York Press, 1997), p. 157. Cross, note 7, p. 16. Juliet B. Schor, The Overworked American: The Unexpected Decline in Leisure (USA: BasicBooks, 1991), p. 74. Quoted in Hunnicutt, note 9, p. 41. Hunnicutt, note 9, p.; 42. Quoted in Cross, note 7, p. 41. Quoted in Ibid., p. 38. Ewen, note 5, p. 19. Cross, note 7, p. 7. Hunnicutt, note 9, p. 43. Robert Eisenberger, Blue Monday: The Loss of the Work Ethic in America (New York: Paragon House, 1989), p. 11. Hunnicutt, note 9, p. 79. Cross, note 7, p. 85. Schor, note 15, p. 78; Daniel Yankelovich and John Immerwahr, ‘Putting the Work Ethic to Work’, Society, Vol. 21, No. 2 (1984), p. 59. Cross, note 7, p. 155. Schor, note 15, p. 2. Cross, note 7, pp. 5, 9. Ewen, note 5, pp. 43-5. Robert E. Lane, Political Ideology: Why the American Common Man Believes What he Does (New York: The Free Press, 1962), p. 80. Ewen, note 5, pp. 77-8, 85-6. L. Macdonald and A. Myers, ‘Malign Design’, New Internationalist (November 1998), p. 21. Marchand, note 4, pp. 162, 222. Quoted in Ewen, note 5, p. 92. Daniel Bell, ‘Work and Its Discontents (1956)’, in A. R. Gini and T. J. Sullivan (eds), It Comes with the Territory: An Inquiry Concerning Work and the Person (New York: Random House, 1989), pp. 122-123. Vance Packard, The Status Seekers: An Exploration of Class Behaviour in America (Harmondsworth, Middlesex: Penguin, 1961), pp. 269-70. Andrew Hornery, ‘Family Pack aims for the children’, Sydney Morning Herald, 24 September 1998, p. 45. Packard, note 84, p. 271. Ely Chinoy, Automobile Workers and the American Dream, 2nd ed (Urbana and Chicago: University of Illinios Press, 1992), p. 126. Stewart Lansley, After the Gold Rush: The Trouble with Affluence: ‘Consumer Capitalism’ and the Way Forward (London: Century Business Books, 1994), p. 85. Greg Whitwell, Making the Market: The Rise of Consumer Society (Melbourne: McPhee Gribble Publishers, 1989), p. 7. Ferdynand Zweig, The New Acquisitive Society (Chichester: Barry Rose, 1976), pp. 15, 21-2, 26-7. Cited in Lansley, note 90, p. 136. Alan Thein Durning, How Much is Enough: The Consumer Society and the Future of the Earth, ed. Linda Starke, Worldwatch Environmental Alert Series (London: Earthscan, 1992), p. 34. Quoted in Thomas H. Naylor, William H. Willimon and Rolf Osterberg, The Search for Meaning in the Workplace (Nashville: Abingdon Press, 1996), p. 69. Durning, note 94, p. 22. Bell, note 71, p. 68. Elites: they are playing with your marbles.